Our Co-Founder and COO, Marios Anaplitois, was the guest speaker at CUTech’s Technology Research Consortium. Below is a blog post created in collaboration with CUTech on his participation. CUTech commits itself to provide leading resources in the Credit Union industry to best advise, guide and facilitate conversation and technology to best increase their competitive advantage. Through CUTech’s Technology Research Consortium, we introduce emerging technologies that will advance CU’s stake in their craft and adapt to the omnipresence of new technologies. Bouquet.ai, is an example of such new capabilities that, if implemented, foster immense growth for CU’s and streamlines their business processes. We honor our commitment to providing our community members with the necessary resources to enrich and educate them for success with these semi-annual forums. 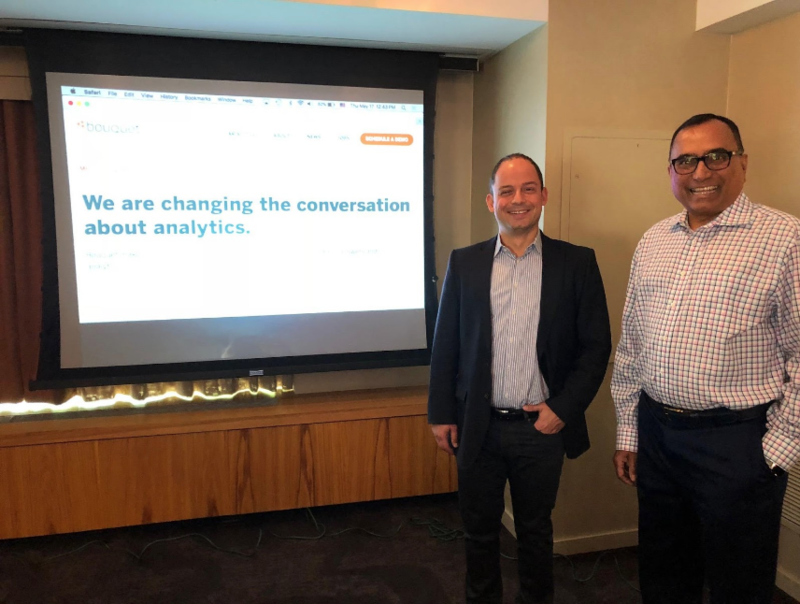 We were honored to have Marios Anapliotis, co-founder and COO of Bouquet.ai, as our guest speaker at this year’s spring forum on May 15-18, 2018. Anapliotis has 20+ years of experience in conceiving, engineering and introducing commercially successful products for business intelligence, artificial intelligence, billing and subscription management, and online gaming. He fuels his passion for innovation by creating valuable IP and solutions that were once never thought possible. He and his co-founder, Adrien Schmidt, founded Bouquet in an effort to make finding and receiving data simple. Companies are constantly bombarded with an influx of data from confusing and complicated interfaces. This form of information retrieval lacks organization and eats away a large percent of an analysts day. They believe that the time spent receiving and analyzing data can be better used somewhere else. They strive to make finding data as simple as a natural conversation. With this mission, Bouquet.ai was born. Bouquet.ai is an enterprise software system that powers the world’s first AI-powered chatbot called Aristotle. Aristotle turns data analytics into meaningful conversation, acting as a personal AI-analyst on-the-go, 24/7. Aristotle is an essential tool in the financial market as it will process all the necessary information you need instantly. Aristotle becomes your trusted sidekick, delivering graphs, charts, lists and voice commands for all your data needs. What was the market value last quarter? Aristotle knows.